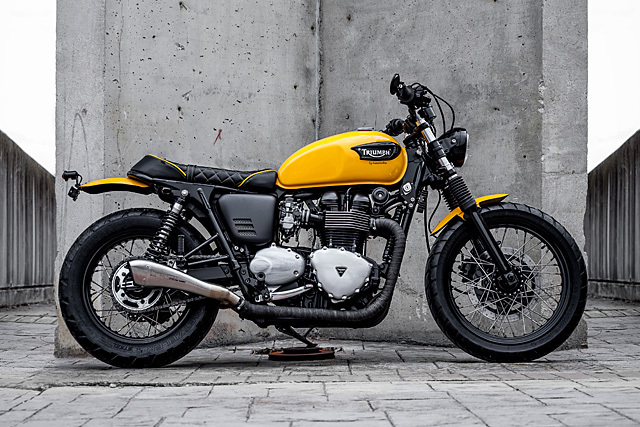 At the heart of every custom bike build, there’s usually a story of a lost bike. There can be a million reasons why bikes get set aside. Mechanical issues, health reasons, young kids to look after – hell, sometimes life just gets all up in your face. And it’s not just old bikes that are hung out to dry, either. 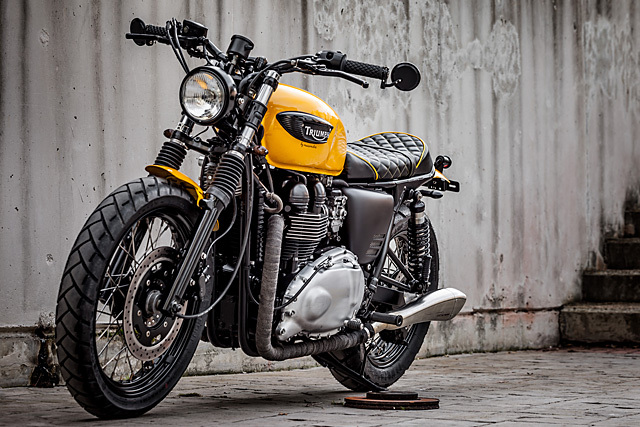 Witness exhibit ‘A’, a 2001 Triumph Bonneville that has spent a third of its life doing sweet F.A. Screw the RSPCA, where’s the society the prevents cruelty to sweet, sweet bikes? 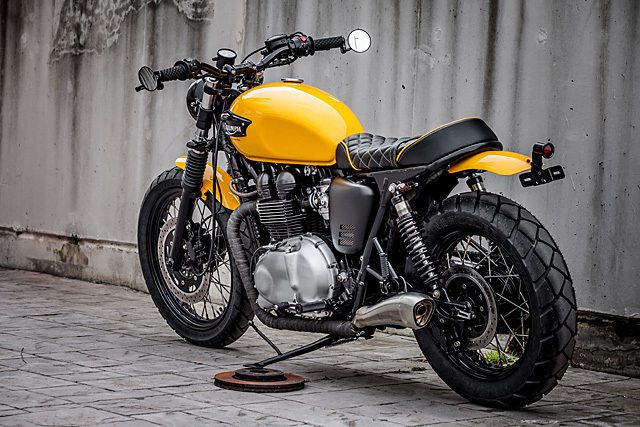 In this case, Spain’s Macco Motors were the knights in shining (or maybe greasy?) armour who rescued this bike from stagnation and turned it into something anyone would be happy to give a home to. Meet ‘The Wasp’. 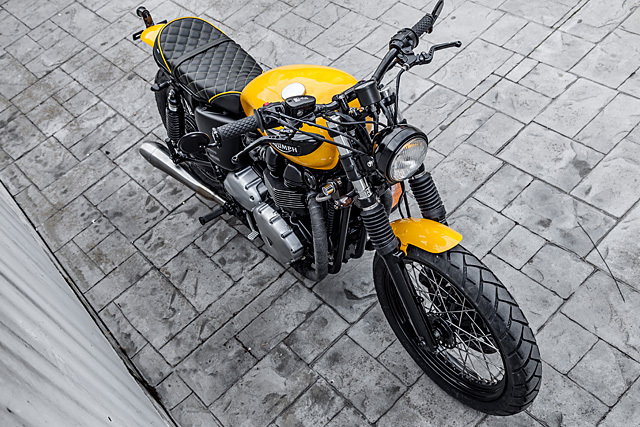 The boys wanted to do a little more than just slap a new coat of paint on the bike and be done with the yellow theme, so they’ve included touches of the same shade into other parts of the bike – most notably the beautiful bespoke seat. 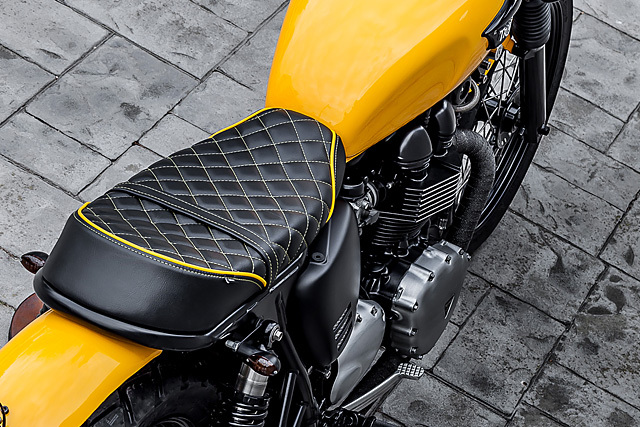 Look closely and you’ll see that the piping at the front and rear nicely contains the more subtle yellow diamond stitching at the seat’s centre. Then came the dirty work. The bike was not only in need of a bath; the boys suspected it had missed a scheduled service or twelve. So in due course, they reversed engineered the living daylights out of the thing until it was nothing more than a pile of dirty parts on the shop floor. Then they started to clean as they built it back up. 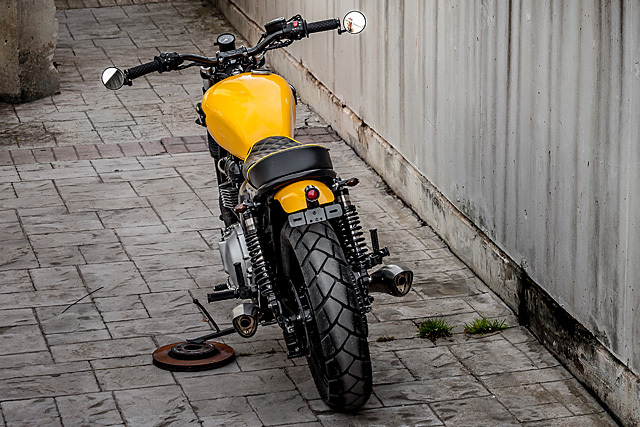 “In this build, the thing that catches your eye after the yellow is clearly the pipes. For these, we adapted a pair of Italian-designed Hp ‘Corse’ mufflers.” While it’s a subtle addition, the tension between the modern-looking dual pipes and the more classic-looking frontend treatment really seems to work. 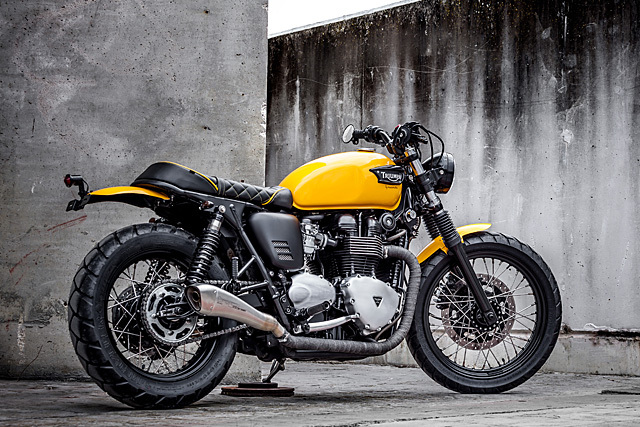 The bike is both better looking, and a little different to most other Bonnie builds we’ve seen. 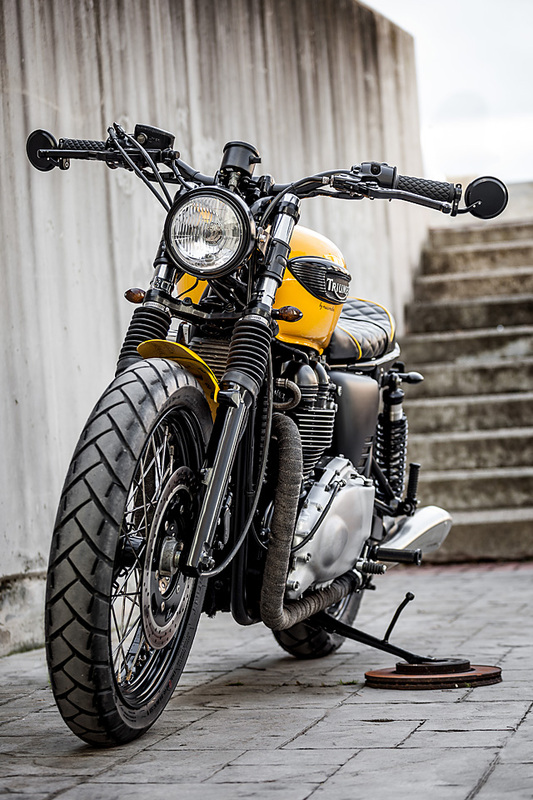 Next, the bike received a fresh set of Biltwell grips, along with a minimal analog speedo. Then came a set of Macco Motors custom fibreglass side panels, painted a matching shade of satin black. Hagon Nitro rear suspension was bolted on, with a matching set of the company’s progressive front springs up at the pointy end of town. 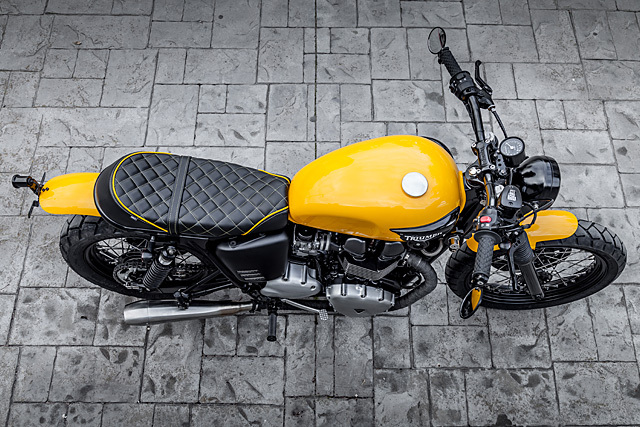 Once the springy bits had been sorted, more Macco Motors fibreglass kit was attached, this time in the form of a freshly yellowed front and rear mudguard. 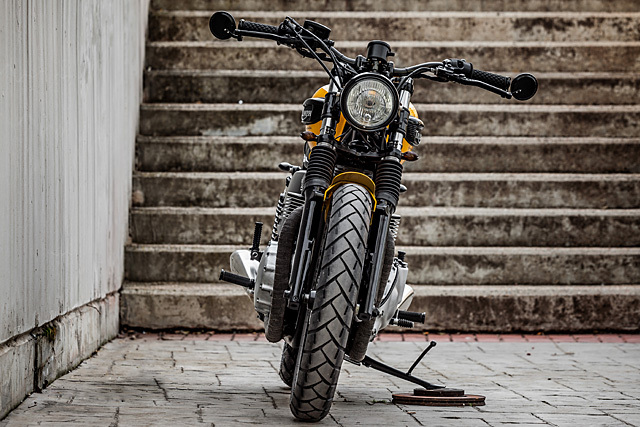 Up top, a new rear frame was constructed to hold the seat in place, and while they were there some turn signals and a fender-mounted brake light were also wired in. Rubber was the next job on the list, with the boys giving it a big old Metzeler Tourance-shaped tick. If you’re looking to recreate these little grippers for yourself, they are 110s at the front and 140s following things up out back. To help Nono hold on once the rubber hits the road, some new alloy footpegs have kicked the original units to the curb. The final steps were to add some racing-style clutch and brake levers and bandage the pipes in what seems to be a fairly subtle pipewrap job. Lastly, they relocated the rectifier and ignition, and threw some new paint at the tank to complete the whole wasp look. And what a look it is. 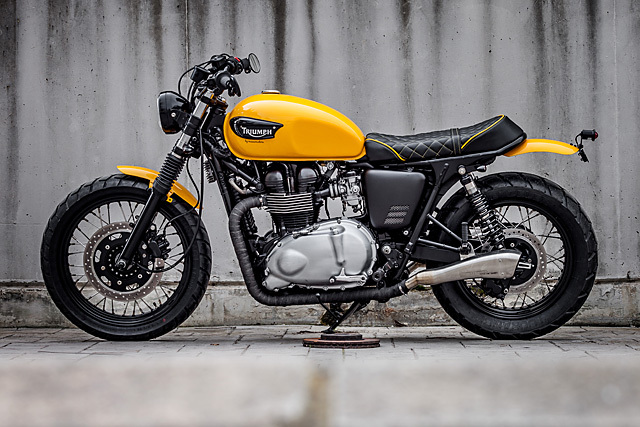 While Macco’s stock-in-trade is to never overdo a build, we happy to report that their chops are clearly improving with each and every bike they finish. Watch this space for whatever comes next; it’s sure to be a killer.